A foraminotomy is a surgical procedure that is performed to enlarge the passageway where a spinal nerve root exits the spinal canal. The term foraminotomy is derived from the medical term for a hollow passageway - foramen. The latter half of the term foraminotomy - otomy - means to remove. During a foraminotomy, the spine surgeon removes bone or tissue that obstructs the passageway and compresses ('pinches') the spinal nerve root, which can cause inflammation and pain. Often the nerve (neuro) passageways are called neuroforamen. The neuroforamen are passageways that are naturally formed on either side (left, right) between an upper and lower vertebra. In between each upper and lower vertebra is an intervertebral disc. The height of the disc separates the two vertebrae and creates the size of the neuroforamen. The vertebral body and nerve structures of a single spinal segment are illustrated in Figure 1. There is 31-pair of spinal nerve roots that shoot off from the spinal cord and exit the spinal canal through the neuroforamen. (See Figure 2) Spinal nerve roots branch out to form an intricate network of nerves outside of the spinal canal called the peripheral nervous system. 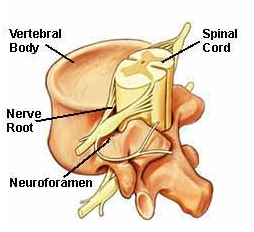 When the size of a neuroforamen is reduced, there is less room for the spinal nerve, which may cause nerve compression. Symptoms of nerve compression include pain, stiffness, numbness, tingling sensations, and/or weakness. 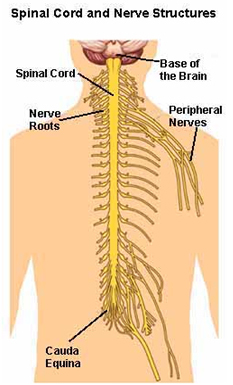 Since spinal nerves branch outward to form the peripheral nervous system, these symptoms may radiate into other parts of the body. For example, cervical nerve root compression can cause symptoms in the shoulders, arms, and hands. Lumbar symptoms may radiate into the low back, buttocks, legs, and feet. Disorders that can cause nerve root compression include spinal stenosis, degenerative disc disease, a bulging or herniated intervertebral disc, bone spurs (osteophytes), or spondylosis (spinal osteoarthritis). Figure 3 illustrates these disorders. Depending on many factors such as the location of the compressed nerve or severity of the patient's symptoms, a foraminotomy may be combined with other procedures such as a laminotomy or laminectomy. A laminotomy removes a portion of the lamina whereas a laminectomy is the complete removal of the lamina. The lamina is a small bony plate that covers the spinal canal. Sometimes removing the lamina (or a portion of it) provides greater access to the neuroforamen. A foraminotomy involves an incision through the skin and muscle to reach the spine. The muscles may be dissected (cut apart) or retracted using an endoscope or tubular retractor. Special cutting instruments and/or a drill is used to remove bone spurs, thickened ligaments, and debris (e.g. 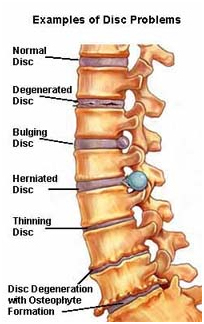 a herniated disc). Removing these tissues from the neuroforamen increases the space for the nerve root. This process is called nerve root decompression. When the spine surgeon is satisfied that ample space has been created around the nerve root, the muscles and interior tissues are closed in layers using absorbable sutures. The skin incision may be closed using absorbable sutures, Steri-Strips®, or surgical staples. Steri-Strips® fall off from the wound as it heals and surgical staples are removed after the wound is well-healed. All surgical procedures carry some risk. The risks from a foraminotomy include the risks inherent to every operation (i.e. a small risk of infection, bleeding etc.). In addition to this there is a small risk of injury to the nerve or spinal cord and this should be discussed specifically with the surgeon. The length of the patient's hospital stay depends on the extent of the surgery. Some patients may be discharged home the same day as surgery. Most patients require a day or two of hospital care. Pain at the operative site is normal and should be expected. This pain resolves over time and can be controlled with oral pain medication. Many patients notice an immediate improvement in some or all of their pre-surgery symptoms. For some patients, symptoms diminish gradually. Patients with a positive outlook and reasonable expectations who comply with their spine surgeon's recommendations do well. Most patients find they are able to return to regular activities within several weeks.